Are you looking for an addicting mobile game to enjoy when you have a few minutes 17 Fast, Fun, and Free Mobile Games for a Quick Fix 17 Fast, Fun, and Free Mobile Games for a Quick Fix Sometimes you just need a game to kill five minutes. 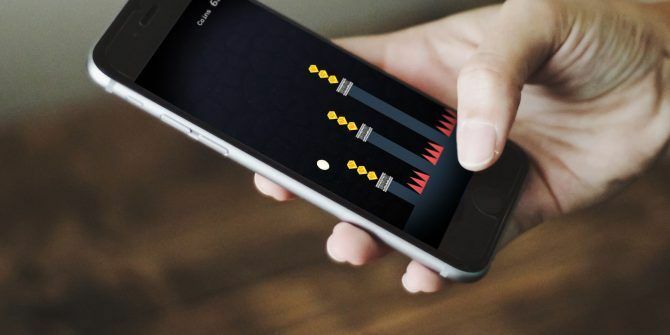 These great mobile games let you have fun in short bursts. Read More ? The ideal mobile game is easy to pick up, doesn’t take long to learn, and is addicting enough to keep you playing. If you’re in search of a new game for your smartphone, then you’re in luck. MakeUseOf’s own creative director, Azamat Bohed, has created a new game at his studio, SuperMegaCool Games. It’s called UnJump! In UnJump!, you control a bouncy ball who must progress through a dangerous cave filled with spikes. Once you tap Play, the game throws you right into the action. The ball moves forward on its own and bounces with a high arc. Your only control is touching the screen, which makes the ball quickly. Hit a spike and you’ll lose a life. This will start you back shortly before you messed up, but beware. After you hit a spike three times, it’s game over for you. You can continue, but it comes at a high price. Hopefully you’ve been collecting the gems along the way, because you’ll need 999 of them in order to continue. Thankfully, your gem count doesn’t reset between tries. If 999 gems is too rich for you, you can watch a short ad in order to gain another try. The game is quite difficult, but you can finish it in under two minutes once you master it. What do you think of UnJump? Be sure to leave a review on Google Play or iTunes! Gave this a shot, as this is not the normal type of game I would play (give me a good RPG any day) - but it was pretty damn good. The music was nice and not intrusive, gameplay took some getting used to, and graphics where nice and retro and simple. However the game would go to a black screen and not return to the game once an ad played. Ended up resetting my phone twice to see if it was the phone, but it didn't want to run properly on a Blade L5 ZTE. Hey Earl! Thank you for trying UnJump! Yeah, that’s a known bug, sorry about that, I’m trying to fix it.